We finally braved flying with kids recently… in fact we had no choice as my sister was getting married abroad. I had flown many times when we had one or two children, but this time it was with all four. I had planned to wait until they were all old enough to carry their own hand luggage and walk through the miles of airport without moaning or asking how much further we had to go. Alas that wasn’t to be and so it was that we packed up several suitcases, four car seats, four kids and two adults and headed to airport. If you are going to Gatwick know that you need £1 for a trolley and can only change £5 note at their change machines. We knew neither of these things and so had to carry and drag 4 cases, 4 car seats, 4 kids and a double buggy to check in – now that was a work out and a lesson learnt the hard way. Be aware that grown ups can be awful and that you are flying with them too… Our kids can be very noisy and troublesome, but they were so good on the plane I wanted to kiss them. Yet still some old man was tutting because they cheered when the plane took off. They were just excited! Miserable old sod! Bring spare clothes even for the most potty trained as they WILL spill something everywhere at some point. In fact in our case I managed to tip coffee (thank goodness cold) all over one of the littles. 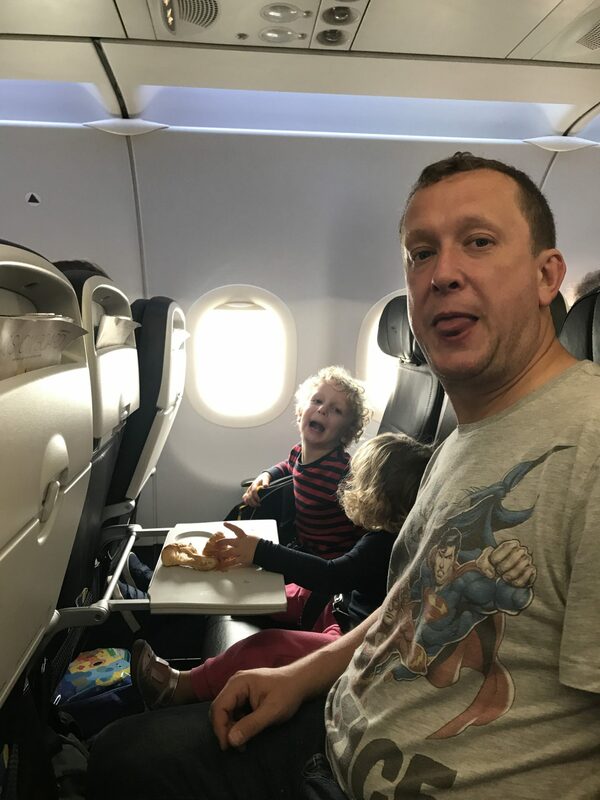 Know that you can get travel sickness on planes… obvious right, but it did not occur to me when flying with kids that the child who is sick on every car journey would also get sick on a plane (idiot!! – me not her) It made landing very awkward with the surrounding passengers I can tell you – whoops!! That brings me to nappy sacks… Bring nappy sacks even if everyone is potty trained. They are also useful for sick and coffee soaked clothes and hide smells for the airport transfer! So the flight itself was fairly uneventful except for projectile vomiting on landing, but it was the trip through the airport that I found stressful. Apart from the whole lack of a pound debacle we were fairly organised (I plan for weeks before we go on holiday for tips see Holiday Preparation) so it should have been a straight forward process, but it wasn’t! With BA at Gatwick you now have to do self check in which under ordinary circumstances probably wouldn’t be that tough, but it is a complicated process to attach car seats and travel cots to the luggage check in as they count as bulk items. We ultimately needed a staff member to assist as it kept not adding the cots and it also has to be done individually so attaching one item to one ticket. Again for most people with a sensible number of children this probably wouldn’t be too onerous, but for us, it was long! You then have to carry the heavy items them to another location which we could have lived without. Of course if you remembered your £1 you could just push them there…. It seemed like we were doing half of the ground crew’s job! I rather expected that I was about to be asked to fly the plane too – fortunately for all concerned that was not the case. It did all leave me a bit non plussed as to why the flights were so very expensive! Gatwick have a family security section which is amazing as you don’t have to join everyone else and it was so quick. In fact we were the first people through. This section was closed when we were checking in and only just opened in time for us to go through. That was at about around 8am. I would recommend checking before travelling or better still before booking as it really did speed up the process. If it is going to be closed when you are there I would leave extra time. In this family area they are prepared for things like buggies and baby milk. There is no confusion and it is a really smooth process. The same cannot be said for moving my husband through the airport. He just wanders!!! We left loads of time so we didn’t have to rush and the speed of security bought us extra time. This was perfect as our boys always move at a glacial pace when they are required to be quick. If you have an expensive buggy this can be rather daunting. Be warned you will be told where to leave the buggy. In my experience it always seems a rather random place to leave something that might have cost you several hundred pounds. You feel like you are abandoning it and may never see it again. We have a travel buggy that we bought second hand for this purpose. It was cheap so I don’t have to stress about it being thrown about the luggage area. Another mummy also recently reminded me about having a bag for your buggy to help to protect it. I have a generic one which was cheap as your hat and works just fine. My mother is rather handy with a sewing machine so also made me two bags for the car seats as I didn’t want these to be damaged either. Remember depending on where you are flying to you may or may not get your buggy back at the aircraft door. If you fly back to Gatwick you will NOT get it back until luggage collection. Be prepared for this long walk with small kids. I recommend taking an ergo baby carrier for up to 3 year olds. So would we do it again?? Maybe one day. I certainly won’t be so daunted about going on a plane with all four of them next time. They really were very good and actually easy to manage. I still think going in the car and to France is much easier and less stressful at this point. Mamma Prada has some great tips for road tripping with kids. It is a long drive for us, but for the kids it is a breeze they just go to sleep… Et voila, holiday! There are also some positives to be found when flying with kids such as jumping the queues and ultimately you do end up on holiday so it is not all bad. Brilliant post. I hadnt realised that ba does self check in, i thought that was just ryanair. We’re flying from stanSted at 6am on easter monday, its going to be pretty hideOus i expect! Neither did I. It didn't seem much different from ryanair this time ;) The good thing about flying on a bank holiday is that I would expect them to know it would be busy and have lots of staff on. Good luck!